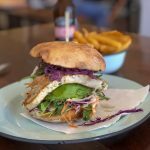 Summer is here and the time is right for fresh places to eat in Byron Bay. Enter with a ‘bang!’ Bang Bang Byron Bay. 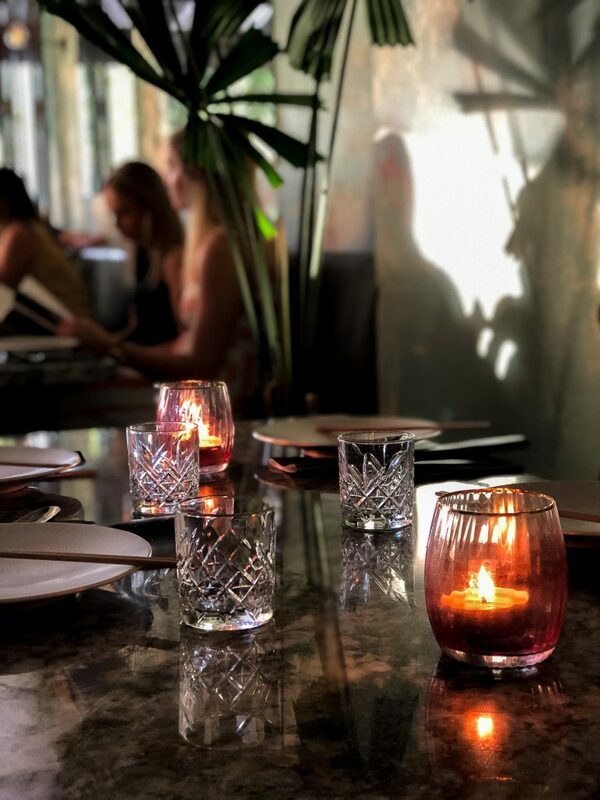 A pan-Asian venue open until late seven days a week for lunch and dinner that is currently attracting diners in droves. 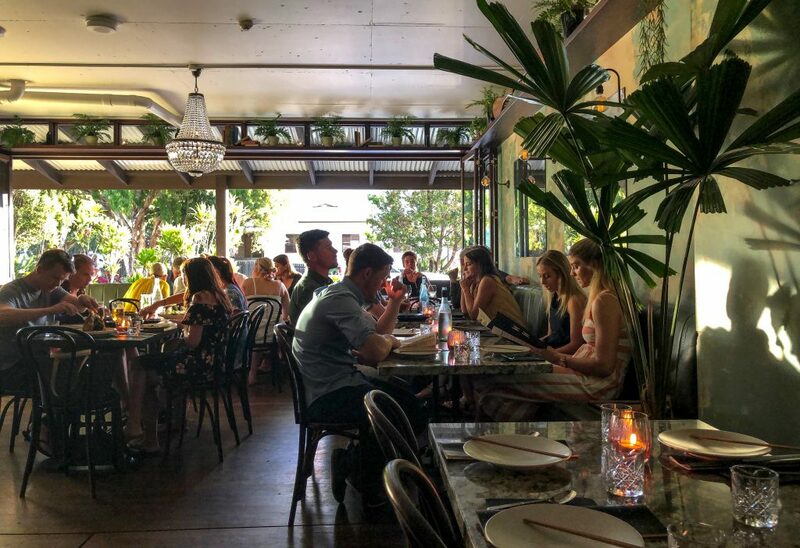 Bang Bang timed its arrival perfectly, making the most of Byron’s Christmas trade as well as the endless Summer holiday crowds that have been on rotation at revolutions per minute faster than Bang Bang’s resident DJ can spin that wheel. 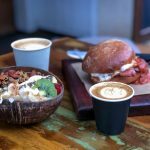 Bang Bang is on the corner of Fletcher and Byron Streets in Byron Bay where the old Earth’n’Sea pizza parlour had been for many years. It’s a pretty large space with window seats all round as well as regular table and high table dining. 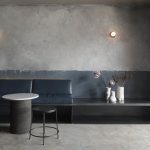 The restaurant fit out is a blend of rustic industrial, softened with loads of lush greenery and plaster look walls . The dining space has nooks and spaces for couples and groups that wrap around the open kitchen . Over Summer we have visited Bang Bang for a couple of dinners and for lunch. My dinner experiences were okay, but I would much prefer to visit for lunch or in the afternoon to avoid the noise from the music and crowds and the dim lighting after dark. On one visit our group of six was seated in a corner where we felt suffocated by the noise and the lack of airflow. It was uncomfortable and hard to have a group conversation. Friends dining in the window seats a few tables away enjoyed a much better experience. Another night we were seated on the opposite side of the restaurant in front of the air-conditioning which had to be turned down as we were all freezing. It’s obviously a tricky space to regulate the temperature – maybe fans would help – I don’t know. Having said that, during the daytime recently we enjoyed lunch in the window seats and it was great to have some fresh air and the music and crowd volume was just right. 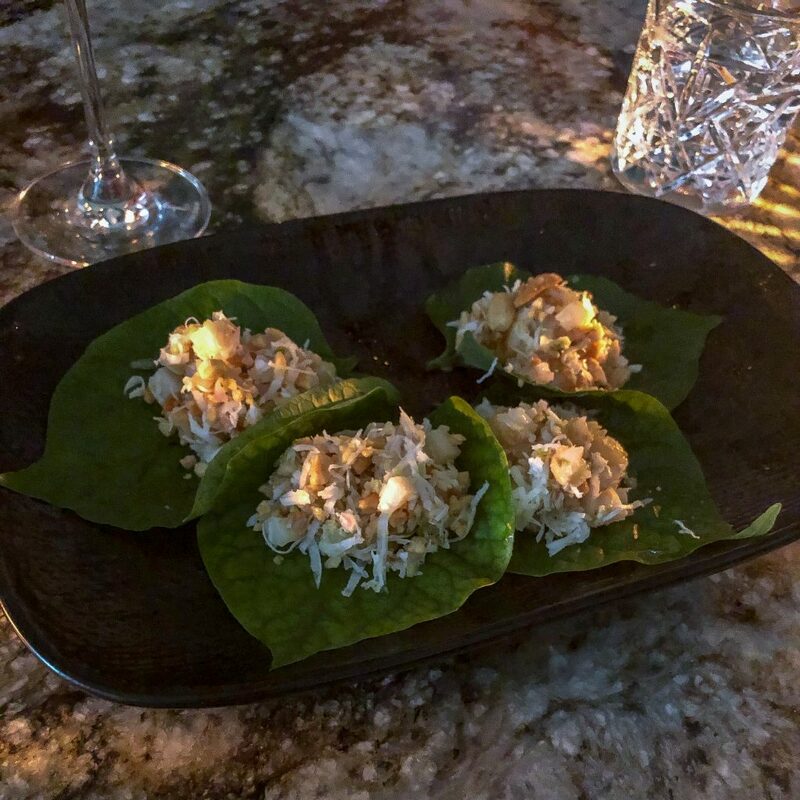 Miang (Betel Leaves) at Bang Bang in Byron Bay. It got too dark to take any other photos! 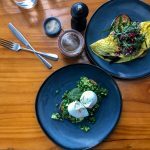 The food at Bang Bang is great and designed to share so you can taste more! The lunchtime menu is a condensed version of the dinner menu. For dinner we’ve enjoyed the chef’s banquet with friends, and we have also experienced ordering our own selections from the menu. 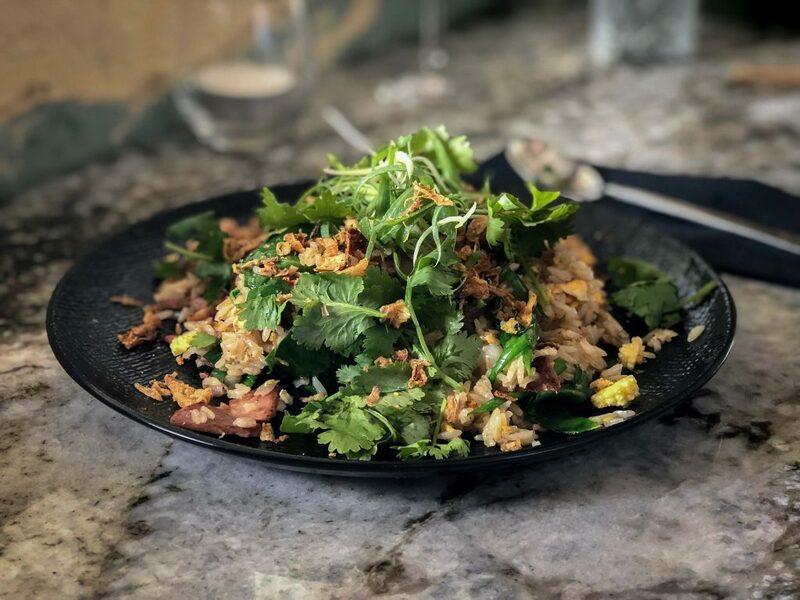 The Bang-quet (not a typo) is a tasting menu of dishes which vary nightly but includes plates such as Kingfish Sashimi, Salt & Pepper Squid, Crispy Fried Chickens, Tom Sum (Green Papaya Salad), Pad Thai, Fried Rice, Braised Beef Massaman and Watermelon Granita. It’s a great way to go if you’re dining in a group. Our group of six for the banquet included one person on a gluten free diet and she was able to eat everything served which was great. 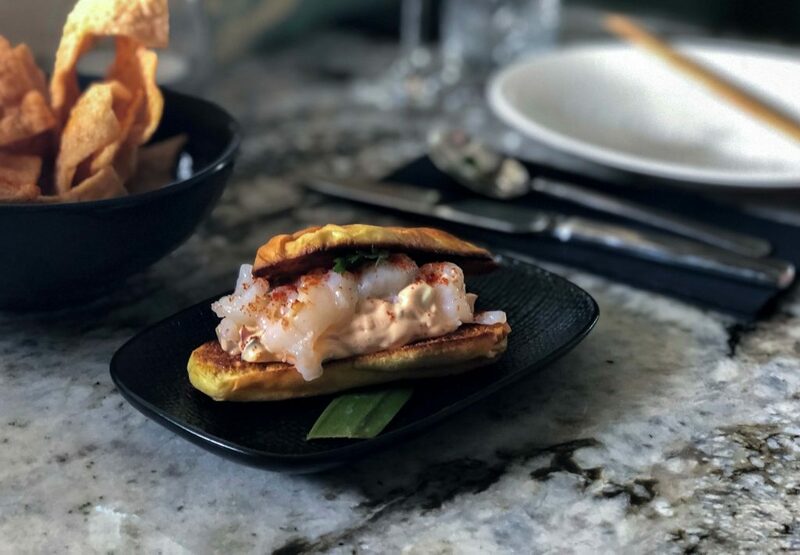 Dishes I can highly recommend include the Moreton Bay Bug Bun featuring a butter poached bug tail with Viet slaw and chilli mayo on a toasted milk bun that was like a melt in the mouth brioche. The Braised Beef Massaman has delicious and rounded depth of flavour and super tender meat and potatoes. The only problem was there was too much sauce for the dish which seemed wasteful when it is so darn delicious. The Sticky Braised Beef Ribs are sensational – a 600g Cape Grim short rib, braised and roasted with sweet caramel and served with coconut and herb salad. 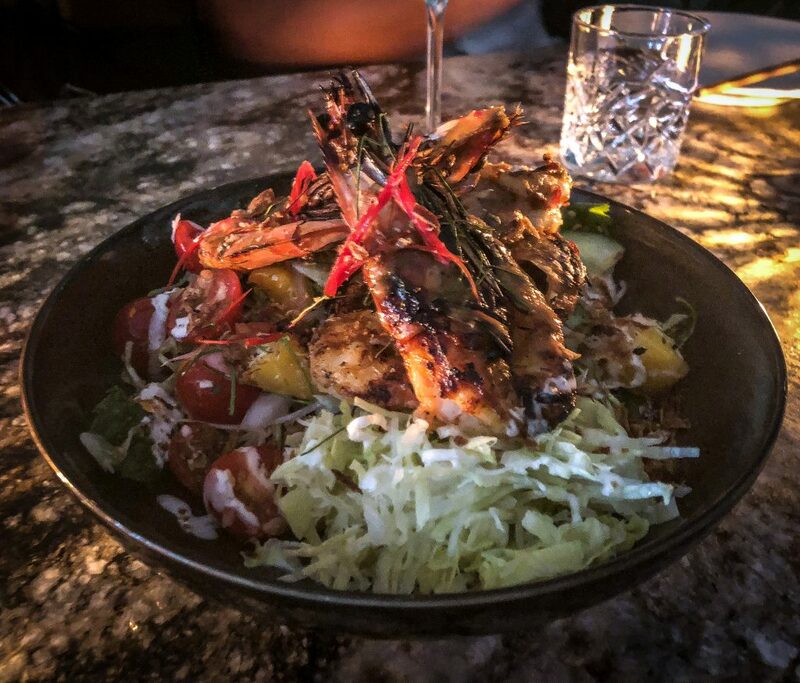 Our guests from north of the border were impressed with the Chicken Satays and local Grilled King Prawns with mango, coconut, mint and chilli. 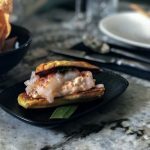 Next visit I’m going to order the Crispy Masterstock Duck and the Soft Shell Crab Slider. For drinks at Bang Bang Byron Bay there is an extensive cocktail list if that’s your thing otherwise there are plenty of beers, ciders, spirits and wines to choose from. I love that they also offer sparkling water on tap for no charge. Cheers for that! 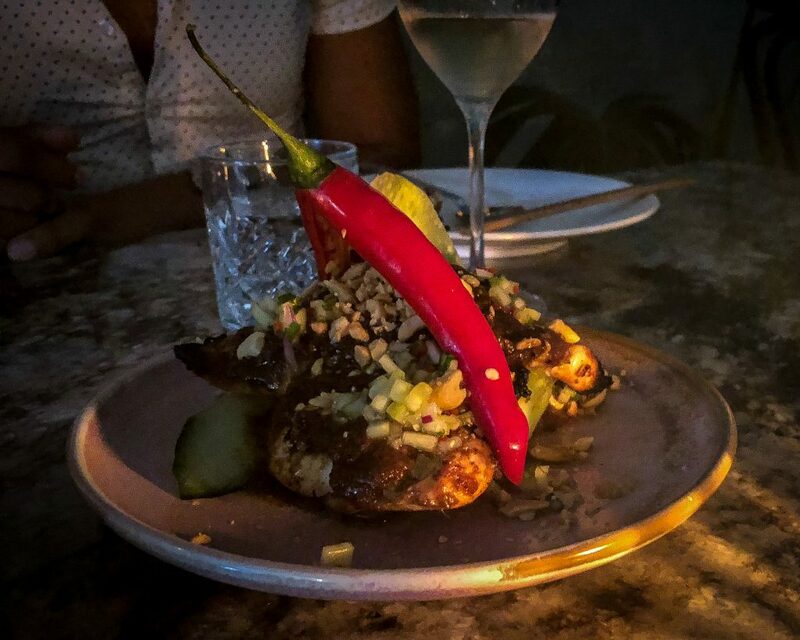 Bang Bang in Byron Bay is a much-needed late night dining venue serving delicious pan-Asian food that has already won the approval of many locals and now visitors to Byron. The loud music and noisy atmosphere at Bang Bang, combined with the lack of light after dark, might be a turnoff for some – (ok … call me Grandma) – but I look forward to enjoying some long lunches with friends or even early daylight savings dinners with Mr GFAF before the lights go down and the volume goes up.